In Nihonmatsu, there are many chrysanthemum lovers from the period of clan government and chrysanthemum figures have decorated the town from the early Showa period (1926 to 1989). 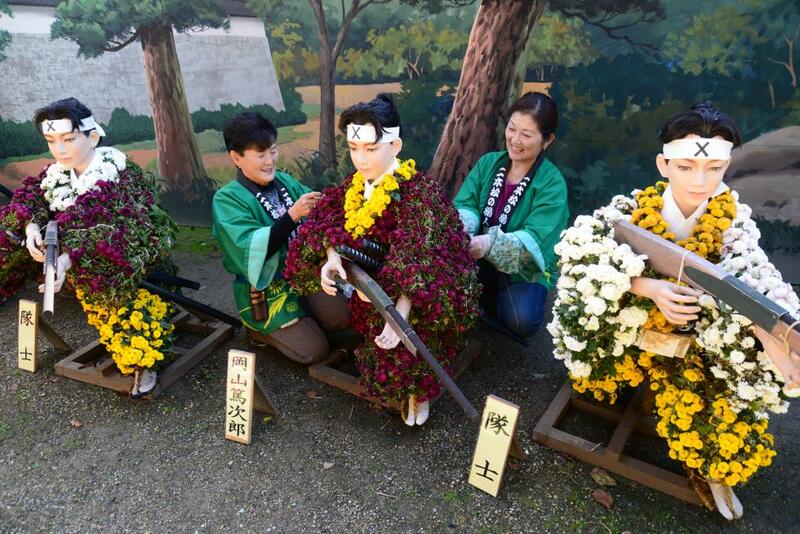 Since 1955, every year the "Chrysanthemum Figures Exhibition" is held at the prefectural Kasumigajo Castle Park, which is the Nihonmatsu Castle ruins, and now its name is known all over the country as one of the foremost chrysanthemum festivals in Japan. You can see gorgeous chrysanthemum figures dressed in colorful chrysanthemums as well as the sophisticated cultivation techniques such as "Senrinzaki" which allows more than 1,000 flowers to bloom one stem and every year the area is visited by numerous tourists who fully enjoy the feast of the chrysanthemum. The Exhibition is held every year from the beginning of October to the end of November, and the city area is also decorated with chrysanthemums during the period.